From June 2017, you’ll no longer be able to use active content when creating your listings. This is to help make sure your listings perform optimally on mobile devices, improving the shopping experience and helping you sell more. Though because of this, features like the Neto shipping calculator can no longer work on your listings. So that our merchants can still use our shipping calculator for their freight listings, eBay have whitelisted Neto as an external link destination. 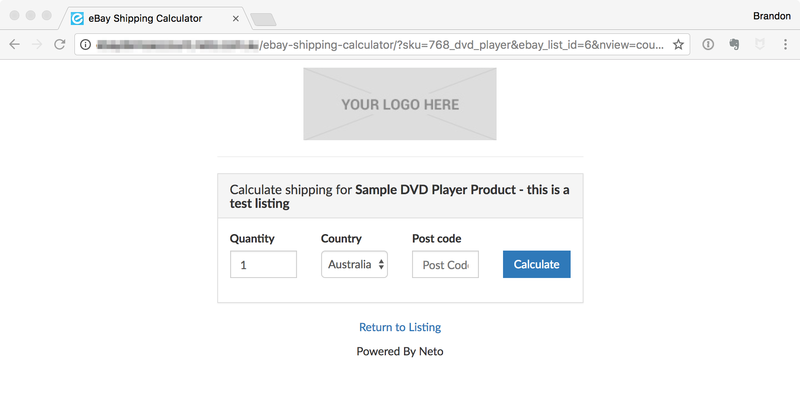 Now, you can link shoppers to https://www.neto.com.au/ebay-shipping-calculator/?site=[&commat;config:homeurl&commat;] and this page will automatically redirect to your website homepage. With some additional query strings in the URL, we can transform this page into a dedicated shipping calculator for your eBay listings. Please Note: This solution is only supported for merchants with the Neto eCommerce addon installed. In addition, the calculator will only function on freight type eBay listings. It's also worth noting that eBay recently announced rate table support, so you’ll likely be able to provide even more accurate postage charges to buyers without our external calculator. You can read eBay's announcement here. We will first need to download the relevant files. We have two versions of the code, one which includes a suburb selector (useful for if your shipping matrix has different rates for each suburb) or a standard shipping calculator that uses postcode. Download the standard ebay shipping calculator here. Download the suburb shipping calculator here. First the file called ebay_calc.template.html, which should be added to your theme directory > templates > cms. Next the file called shipping_calc.template.html, which should be added to your theme directory > templates > cms > includes. Finally, add the 'Design Template' to your 'eBay Listing Template' so it's on a live eBay listing. Your eBay listing will now have a link to your self-hosted eBay shipping calculator which complies with eBay's active content. Note: This solution will work on mobile web browsers, but the eBay mobile app will not support this functionality. This is because the eBay mobile app displays the calculator in the application instead of a browser, and the mobile app doesn't support the technology necessary to use the calculator. We have taken this into account and when a customer goes to the shipping calculator via the mobile app it will display a message informing them to use the calculator on a modern web browser.